Installation of glass structures is as important as windows production process. Even the most high-quality windows can be ruined by faulty installation. Therefore in our company the installation is carried out only by masters with decades of experience. 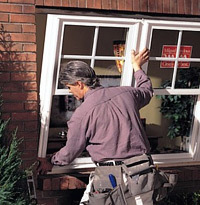 Depending on the order installation includes the installation of windows, flashings and window-sill. At your request, there can be a mount using special mounting tapes. Installation in winter is at or below 10 degrees. Dismantling of old windows and installation of new ones – the work with a lot of dust. So, prepare the room for installation before it . Provide access to the windows – move the furniture, which is under the window opening or in the immediate vicinity. Cover the floor, radiators, furniture and electronics with the help of construction films and securely fasten it.